With thanks to Denis Pickles for providing the scan and notes. "At the end of September, I was in Sutton and I called in at the Kings Arms for a drink. Whilst in there I chatted with some of the locals and I think it was there that the name of Frank Ingham cropped up. I said that I had a photo of Frank somewhere and this evening I have found it. Frank was a good friend of my uncle Walter Pickles and he acted as Best Man at his wedding. 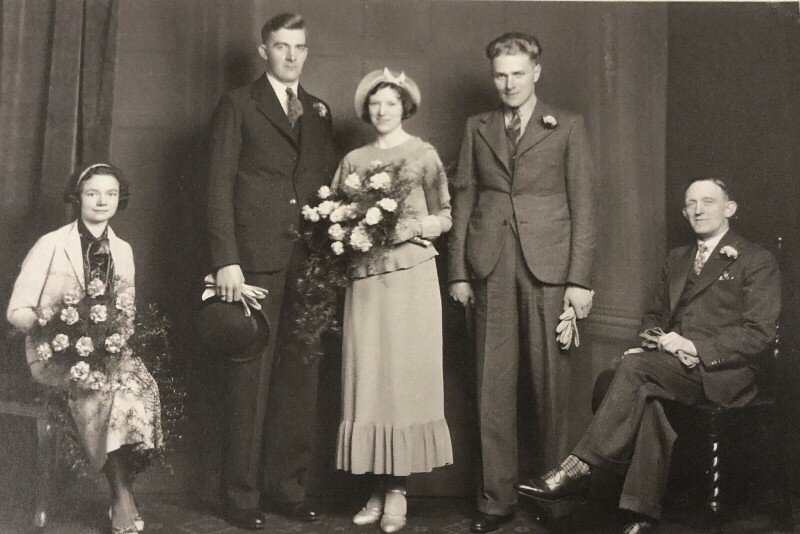 In the photo are Patti (Patricia) Rimmer?, Walter Pickles, Betty Pickles (nee Shackleton from Denholme), Frank Ingham and Betty's dad. Frank would have been farming at New Laithe farm at the time but he would leave the place shortly afterwards because early in the war years my uncle George Hargreaves was in residence together with my aunt Mary and cousin John."